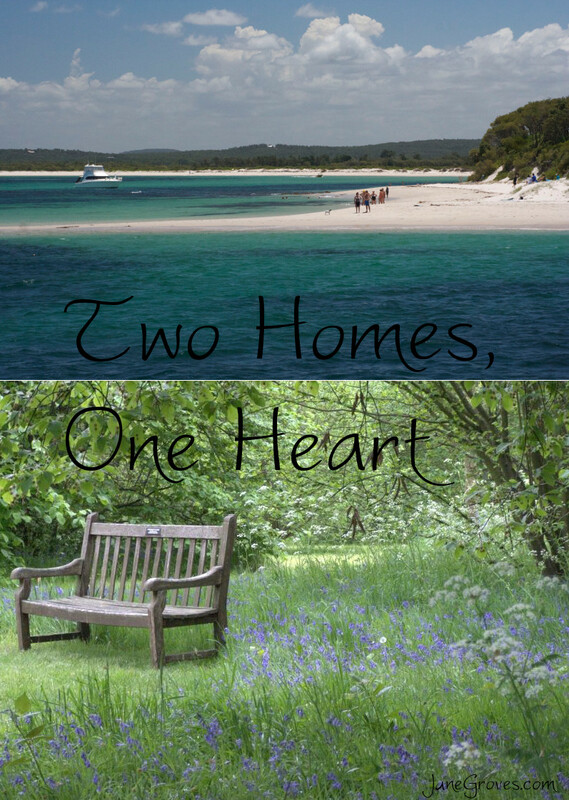 Two homes, One heart. That’s how I’ve been feeling lately. I’ve been thinking about the concept of home a lot recently and about how I can’t limit myself to calling one country ‘home’. I was born in Australia and 10 & 1/2 years ago I went travelling to the UK for a working-holiday. I enjoyed it so I decided to stick around for ‘a little while longer’. Well, 1 year turned into 2, which turned into 4 and well, you get the idea. I am constantly asked when I meet someone new and they discover that I’m Australian ‘When are you going back home?’ It’s not in a ‘On your bike you foreigner’ type way but more in the ‘We can’t imagine why someone from Australia would want to stay in the UK’ type of way. They think of endless summer days, relaxed attitudes and ‘better’ politics (although with the craziness that’s happening in politics everywhere at the moment that is debatable). They look at the reputation of England being cold and wet and question why would I would want it. But I do. England is my home now. There are so many things I love about my new country. Australia is still my home too. Can you have two homes? With all the bad press my two homes are getting in the world news at the moment I thought I would give you a little insight into why I love them. I love having 4 seasons. Spring and Autumn have things happening in them apart from just rain!! I know, cool right?! Winter often has snow and the country is built for the cold so that you can enjoy a pint at a local pub in front of a roaring fire. I love the history. A historic building in Australia is 100 years old. The house I currently live in is 100 years old and it’s in no way protected/listed/fancy. The UK has castles (CASTLES!!) and towns that haven’t been changed in hundreds of years. I was in Lacock (please feel free to snigger at the name, I did) the other week and it was like stepping back in time (fun fact, that’s the town used in loads of historical dramas – the scene in Harry Potter when they go to Godric’s Hollow at Christmas time is Lacock). The architecture is amazing and there is always another detail to see. The UK oozes history and I love it! As a book lover, I of course need to add bookshops to this list. Australia never had many and there are fewer and fewer each time I visit. In the UK we have the big brands like Waterstones and Foyles (and Amazon for online orders) along with some fantastic independents and 2nd hand bookshops. I have spent many, many, many hours in all of the above. I love the gardens of England. No need for drought resistant plants here. Roses and lavender, poppies and cornflowers, runner beans and rainbow chard, bluebells and cow parsley. It’s a riot of colour and it’s all beautiful to me. On a similar topic as above, I love all the shades of GREEN. Australia has plenty of green but I’ve not seen anywhere to rival all the shades of green in the UK. There are few things which I would rather be doing than lying in the grass, staring at the lime green leaves of the apple tree in our garden while I think about the book I’m reading. The fact that the UK is so small but areas that are only an hours drive away can have a completely different look and feel to it (not to mention a different accent). British TV. I’m not a big TV watcher but I do love that the BBC make some brilliant TV shows which I can watch for free. In the last year I have been known to be addicted to the recent dramas War & Peace, Wolf Hall and Poldark, and the reality shows Strictly Come Dancing, The Great British Bake off and The Great British Sewing Bee. Oh yes, I’m all class. Weirdly I also love that so much is still so new to me. I have a love of learning and there are so many things that I don’t know about this group of countries. I’m looking forward to getting to know it better. The wonderful blue/green water! I grew up near/on the water and nothing clears my head like looking at it or being in it. I also miss having sandy beaches that you can walk for miles on without seeing too many other people, but then I wasn’t in a capital city! The ‘language’. We may all be speaking English but there are times when I really miss the Australian way of pronouncing things or just showing your feelings about what you are talking about by the way you shorten the word. The sky feels bigger and bluer in Australia than anywhere else I’ve been. Chicken salt on your fish & chips at the beach. My brother keeps me stocked up on this but it just doesn’t feel the same as the stuff in chip shops. BBQ’s. We still have them in the UK but they aren’t the same. I miss the BBQ’s built into parks for everyone to use. I miss the relaxed get togethers that you get when someone hosts a BBQ. The sweets/confectionary. Not that I don’t generally try and eat healthily but you can find salad and meat of different standards everywhere in the world, but only the place you grew up in has your sweets. Violet crumbles, timtams, mint slices, cadbury snack, smiths chips, the list could (and does) go on. Yum! I miss the casual nature of sport. In the parts of the UK that I’ve lived I can either (a) Join a gym (b) Join a competitive team who travel hundreds of miles every weekend or (c) play football (soccer). I miss Australia’s cobble together a group of mates to play a random sport, along with the wide variety or sports available at a location which doesn’t change. Sport shouldn’t have to be your life if you want to play it, it should be part of your life! But most of all, I miss my friends and family. I miss having people down the road (read as within an hours drive) who I’ve known for a long time and are always happy to share a cuppa or glass of wine. People who have seen your ups and downs and put up with you anyway. I’ve made some lovely friends in the UK but my Aussie friends are very special to me. I feel at home in both countries and I love them both. Anyone else have this sort of problem?